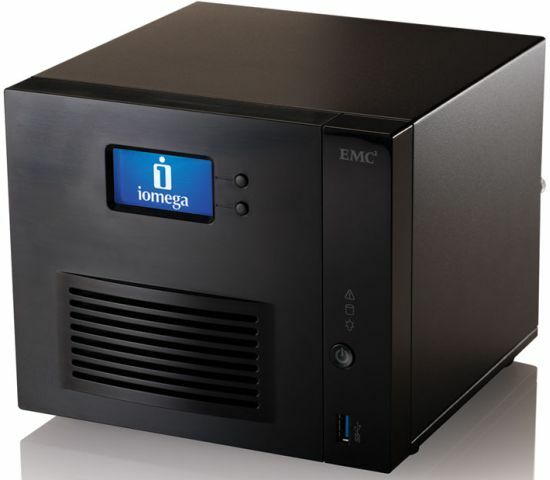 The last time we looked at an Iomega NAS was the 1.8 GHz Atom D525-based two-bay px2-300d, back in November. This time, we are looking at a refresh in Iomega's lower-priced ix product line, the four-bay ix4-300d. The 300d comes in 4, 8 and 12 TB configurations. There is also a BYOD version, but it's not sold in the U.S. We'll be reviewing the 8 TB version (model 35566). The ix4-300d, which replaces the ix4-200d, is based on a 1.3 GHz Marvell Armada XP CPU. The NAS comes with four Seagate 2 TB hard drives. It performs well compared to other Marvell NASes, but you'll be disappointed if you compare it to its Intel-based siblings. The figure below is an angle view of the ix4, with its metal cover removed. All the ix4-300d chassis is metal, except for the black plastic front panel bezel. The lone USB 3.0 port is on the front, but at least it's not behind the drive door like on other NASes' we've reviewed such as the Thecus N5550. It also shows the ix4-300d's side-loading configuration. Although you could remove the metal cover that is secured by two thumbscrews with the NAS powered-up, Iomega says that the ix4-300d's drives are not hot-swappable. The next figure shows the rear panel, where You can see two USB 2.0 ports, power connector, dual gigabit Ethernet ports with support for failover and 802.3ad aggregation and a nice, quiet fan. Unfortunately, there is no eSATA port to attach external drives for speedier storage expansion or attached backup. The figure below shows the ix4's main board, which is based on Marvell's Armada XP clocked at 1.3 GHz supported by 512 MB of soldered-on DDR3 RAM and 512 MB of Samsung flash. Dual Marvell 88E1318 Alaskas provide the dual Gigabit Ethernet ports and a NEC D720200F1 provides the USB 3.0 port. SATA II interface for the four drives is handled by a Marvell 88SX7042 controller. The 8 TB version that Iomega shipped for review came with four Seagate Barracuda 7200.14 2 TB (ST2000DM001) drives that are formatted with the EXT4 file system, which is a change from the XFS file system previous used by Iomega. Table 1 has a summary of the key components for the ix4-300d compared with its -200d predecessor and px2-300d Atom-based sibling. Power consumption measured 44 W with the 4 drives spun up and 17 W with them spun down. Fan and drive noise could be classified as medium with both fan and drive noise audible in a quiet home office.